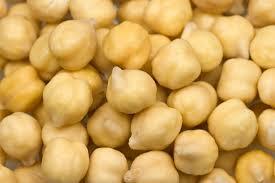 The chickpea or chick pea (Cicer arietinum) is a legume of the family Fabaceae, subfamily Faboideae. It is also known as gram, or Bengal gram, garbanzo or garbanzo bean and sometimes known as Egyptian pea, ceci, cece or chana. Its seeds are high in protein. It is one of the earliest cultivated legumes: 7,500-year-old remains have been found in the Middle East. Chickpeas are a nutrient-dense food, providing rich content (> 20% of theDaily Value, DV) of protein, dietary fiber, folate, and certain dietary mineralssuch as iron and phosphorus. Thiamin, vitamin B6, magnesium and zinccontents are moderate, providing 10-16 percent of the DV (right table). Chickpeas have a Protein Digestibility Corrected Amino Acid Score of about 76 percent, which is higher than fruits, vegetables, many other legumes, and cereals. Start by sowing the chick pea seeds into the soil at around an inch deep, and space them around two inches apart, with the rows separated to about two feet apart. Do not soak the seeds with water right after planting them to keep the seeds from cracking. When the seeds have grown and sprouted enough, thin the plants to around six inches apart by cutting the plants at ground level without disturbing the other sprouts. Chick peas can be grown crowded to offer support to each other. Keep the soil evenly moist as chick peas grow and water regularly when they are flowering and forming beans or pods. Put mulch on the planting beds to help retain moisture and prevent weeds from growing. Avoid adding nitrogen-rich fertilizers to the soil as chick peas have a mutual exchange with nitrogen-fixing bacteria in the soil that enables them to produce their own fertilizer;the addition of exogenous nitrogen can upset the natural balance. Handle the chick peas with extra care so that flowers and pods do not fall off when watering, and do not disturb the roots when cultivating and removing weeds. Do not handle the chick peas when they are wet to avoid fungal spores from spreading. 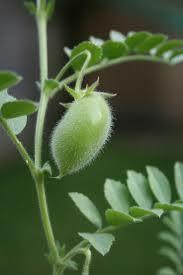 Remove any disease infected plants from the planting bed to avoid affecting other chick pea plants. Stop watering the chick pea plants when they reach maturity to help the beans dry out for harvesting. As lentil plants thrive primarily in areas of low humidity, they do not tend to suffer from many diseases. Blight, white mold and root rot are, however, a few possible disease issues whose most effective method of prevention is crop rotation. Corn is the best options for crop rotation. Lentil plant care is minimal with regards to predation. Lentils can be attacked by aphids,Lygus bugs, maggots, wireworms and thrips; however, this predation is rare. The chick peas will be ready for harvest around 100 days after they are planted. They can be eaten fresh like snap beans by picking them up when the pods are still green. They are commonly harvested when the leaves are already brown, and seedscollected when the pods split after drying. Chick peas grow better in dry seasons because of their root systems;which are dried and tap, and they produce smaller yields when they are grown in heavy rainfall seasons because they are prone to disease outbreaks that affect their roots. Chick peas are better grown in areas with well distributed rain patterns. 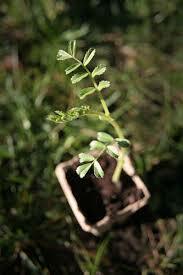 Chick peas are best planted in soils that are fertile and sandy, with good drainage for effective growth. 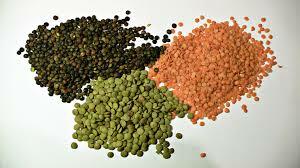 Lentils do not need much fertiliser if planted in rich, fertile soil. Side dress them with a little compost tea when they reach 12cm high and again as they begin to flower.